The Young and the Restless Spoilers: Listen Up, Victoria! First he’s hitting on her, tomorrow Billy’s setting Victoria straight in the “The Young and the Restless” spoilers. 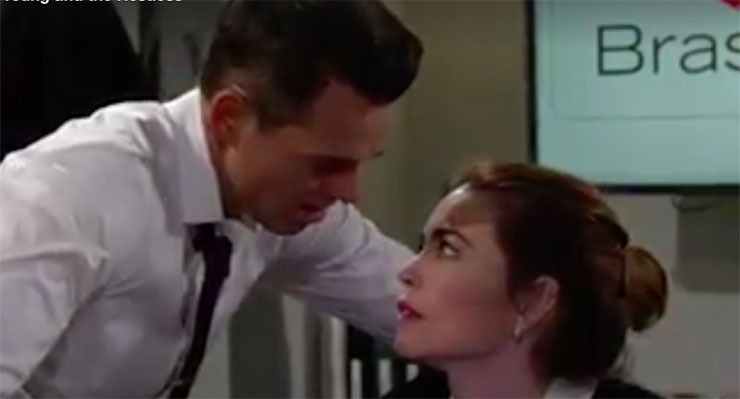 “The Young and the Restless” spoilers for Friday February 10th predict Victoria gets a dressing down from Billy–but not the kind you might think. Also, Lily has an unforeseen encounter. Brash and Sassy is Victoria’s (Amelia Heinle) brain child and passion. Lily’s (Christel Khalil) involvement may be more than Victoria bargained for though. Friday she comes upon Brash’s new spokesmodel striking a pose, while Billy (Jason Thompson) and Cane (Daniel Goddard) look on with smiley satisfaction. Billy, meanwhile, tries to tell Victoria what’s what. She has a lot going on, and sometimes complications in one area of our lives affect our perceptions in another area. As one of her closest friends, Billy may be just the person to help Victoria stop seeing everything through stress-colored glasses. Friday he tries to help her get with the program. The head of the Newman clan, Victor (Eric Braeden) meanwhile, receives an unforeseen appeal from someone. The other day, Abby (Melissa Ordway) surprised her grandfather. She’s looking like the Newman who might take on a new and important role at the family company. Of course, Victor has a great deal of power, in business and interpersonally, so others could be vying for him to do them a solid too! Lily’s new career is shaping up to be a complicated beast. Friday her life takes on another new/not-s0-new facet when she comes across a buddy from her past. Previous ArticleGeneral Hospital Spoilers, Friday, February 10th: Hayden to the Hospital’s Rescue–Stat!